Lovely model build by 'Brad' on britmodeller of the DML kit (ex-Trimaster). 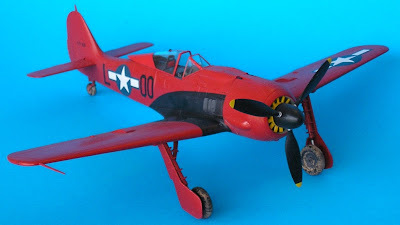 Brad writes " the cowling fought me hard and I couldn't live with the incorrect stance of the landing gear so I cut the retraction struts and added about 1mm of plastic to get the right angle on the main gear. The prop was scavenged from a Tamiya 190A-3 as the prop fitted when repaired was a metal one. Decals came from a variety of sources (now also featured on the new Karaya 'Captured Butcher Birds' decal sheet) and gunze gloss red was used.."
Wagner forced landed this aircraft on 1.1.45 close to St. Trond (home to the 404th FG) during the Bodenplatte raids when Allied airfields across Western Europe were hit in the Luftwaffe's so-called grosser Schlag (big blow). Wagner's Focke Wulf 190 A8-R2 was recovered and repaired to running condition.
" 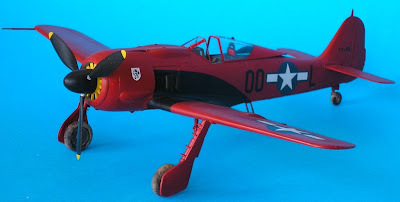 the aircraft was painted red by a crew who had overheard me saying that I had always wanted to own a red airplane ..the OO*L code was placed on it because we had created an 'imaginary' fourth Squadron in the Group, and as in the 508th, we used the first initial of the pilot's name as the last of the three code letters. 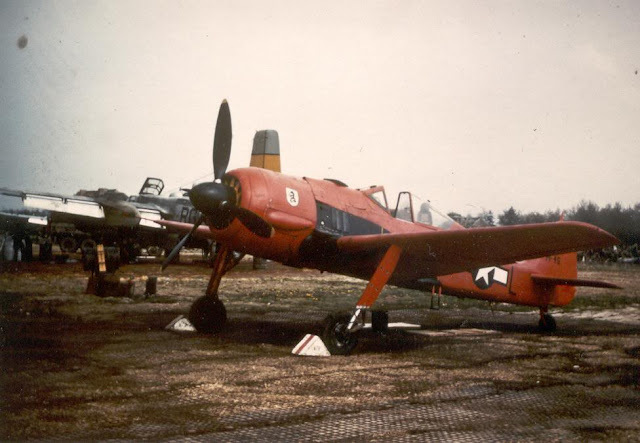 Since I agreed that we should try and get the 190 into flying condition everyone considered it my aircraft and added the 'L' accordingly..when it was ready I taxied it at all speeds up to near takeoff speed but we had no clearance to fly it from the Anti-Aircraft. After taxiing in I found the tires soaked in hydraulic fluid and they were so deteriorated I felt that they were unsafe..we spent considerable time looking for new tires without success. 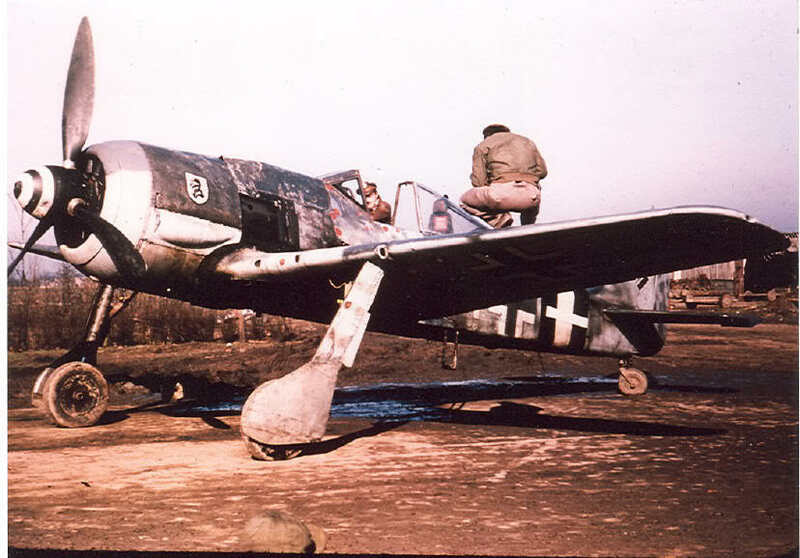 Then we had to move on and left the Fw 190 at St. Trond. I regret that I wasn't able to get that 190 in the air - I had even learnt the 'offs' and 'ons' of the switch labels in German but I don't feel too bad about not flying it. I did get to fly the Bearcat which I believe was more or less a copy of the 190 -although no-one ever admits it..."
Click on the images to expand. Note the yellow fan and prop tips and the red gear legs. The Sturm armour plate on the cockpit sides had been removed for the mission has had the upper cowl MGs.